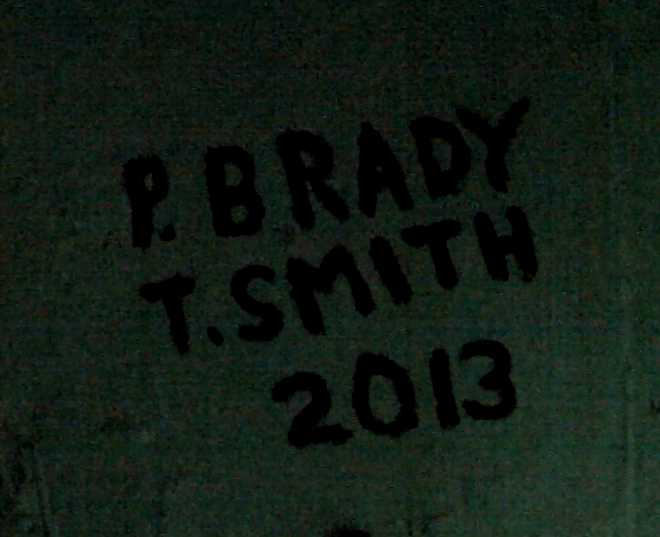 There's a teensy bit of graffiti hidden away in the Giant Ocean Tank. And the only way you might be able to see it (besides being a diver in the big tank, of course) is to attend the daily diver presentations at 2:30 p.m.
A new diver communication system was one of the high-tech additions during the renovations to this central exhibit. 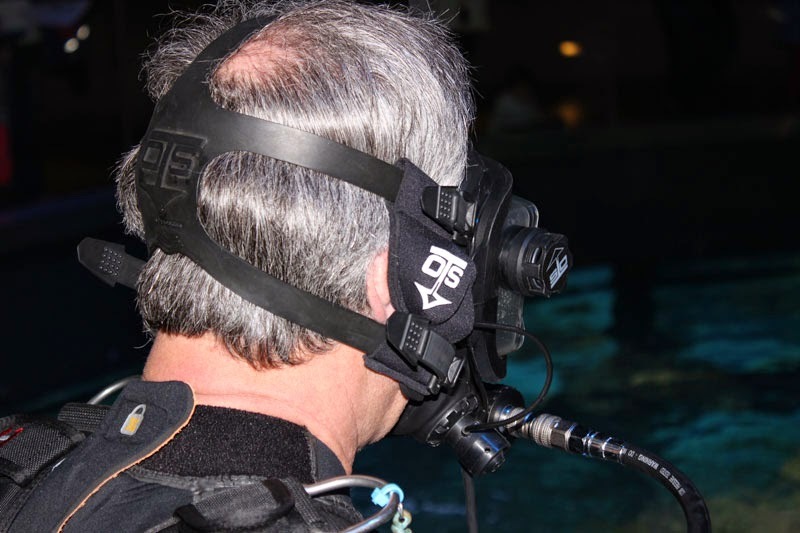 Divers fly a hand-held camera deep underwater, feeding live video to the top of the tank, while wearing a special mask that lets them hear questions from visitors at the top and respond to them—from 23 feet underwater! Not only can visitors find themselves in the middle of feedings or schools of fish, they can ask the divers about their favorite fish, explore those secret nooks that aren’t visible from the windows and even see what visitors look like on the other side of the glass. The divers speaking underwater require hours of specialized training and some fancy scuba gear. Here are the tools of the trade for divers and educators sharing the insider perspective of the Giant Ocean Tank. 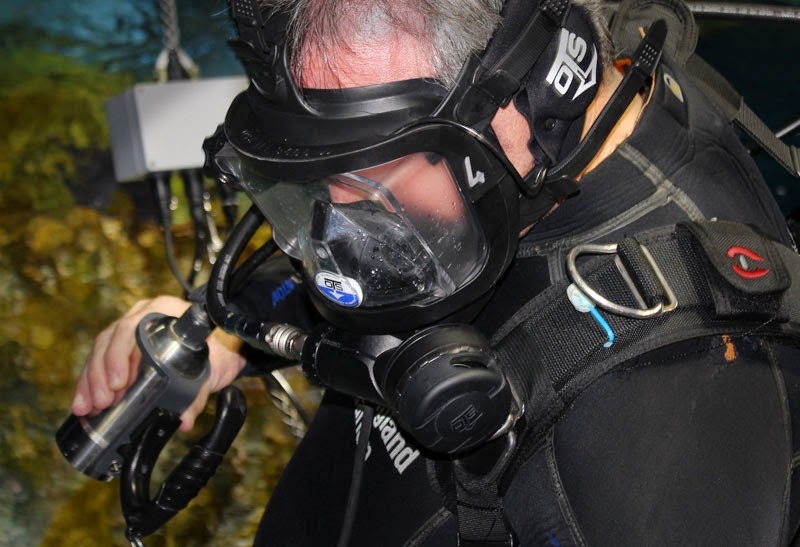 Divers breath and speak through a full-face mask with a microphone. Without a regulator in their mouth, divers can easily speak. 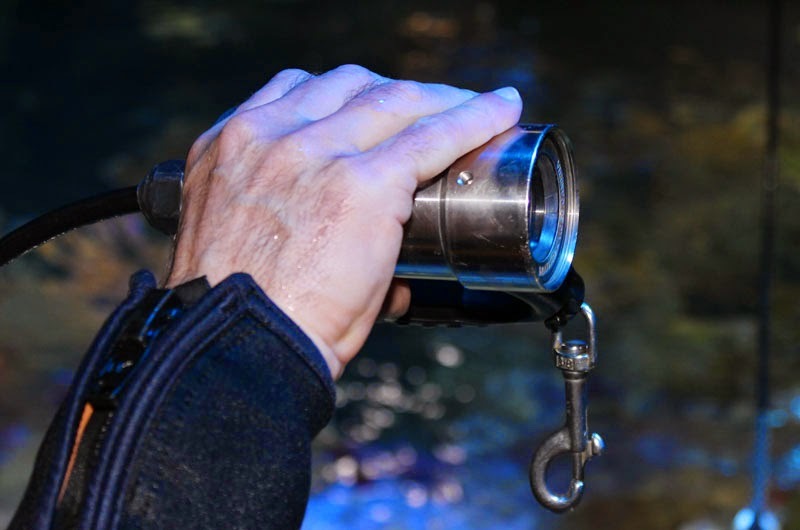 A vibrating disc near the diver’s ear lets them hear the educator at the top of the tank. Since sound travels easily underwater, divers swimming nearby can eavesdrop. The hand-held camera is shiny and sleek, about the size of a can of soup. Some of the fish are very curious about it, so they often have cameos. 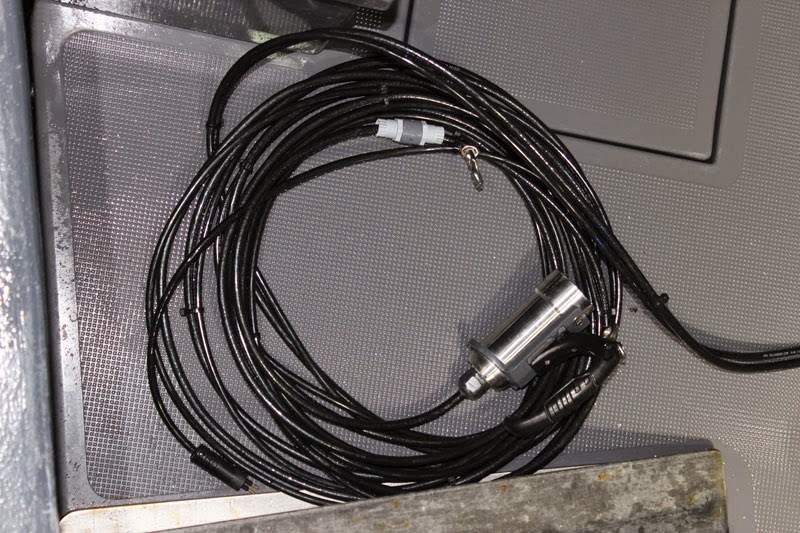 A long cable connects the camera, earpiece and microphone to the broadcast systems. That’s because water is too dense for WiFi—imagine, no WiFi! These interactive talks provide: exciting visuals that you can’t get anywhere else, plus an insider’s perspective on the animals and ecology of Caribbean reefs. 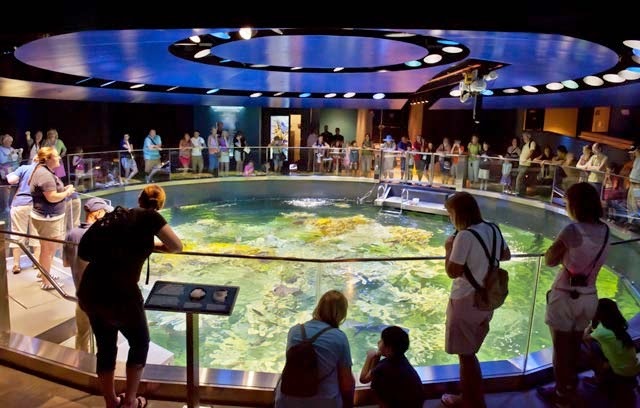 So if you want to dive deeper and learn more about the Giant Ocean Tank and its residents, check the daily schedule of presentations during your next visit and make sure you’re at the top of the tank for these interactive diver talks. Oh yeah, and about that graffiti... At the very bottom of the exhibit, in the dark tunnel that cuts through the reef, you'll find the signature of the artists who created this coral reef. Peter Brady tagged the reef the first time in 1984, when the reef was first made. He signed it again last year when the Giant Ocean Tank was completely renovated. 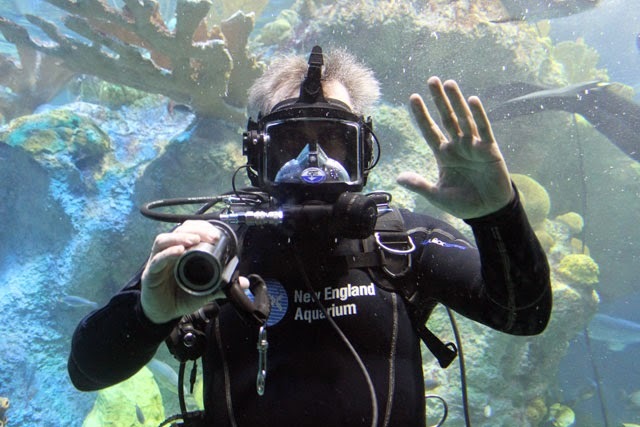 Ask your friendly scuba diver with the camera to show it to you during the next diver talk from inside the tank!